There was an early start this morning to the Montreal class action suits against Canada's three large tobacco companies. The schedule change was to permit plaintiff lawyer Philippe Trudel to file a number of documents related to document destruction in anticipation of tomorrow's hearing with ITL's former librarian, Ms. Carol Bizzarro. (They are Exhibits 319 A B C D E F G H I J K). This was accomplished with a remarkable efficiency, thanks to Deborah Glendinning's offer to apply a blanket objection to each of the documents. ("Much appreciated," said Justice Riordan). The witness had not even been sworn in before the contentious issue of smuggling was raised again. The Court of Appeal has scheduled a hearing this fall to hear why Justice Riordan's openness to evidence on smuggling should or should not be appealed. When Philippe Trudel, for the plaintiffs, sought to introduce a recent Imperial Tobacco document on contraband , Deborah Glendinning, for Imperial Tobacco, was quick on her feet. Even though the document, What's wrong with this picture is available on ITL's web-site, she did not want it entered into the trial record. "This document post-dates the commencement of this suit by ten years," she told the judge. "Besides which, the claimants are confusing the issue -- you ruled on smuggling, but not on contraband. Contraband and smuggling are two different things." Justice Riordan was not the only one that looked confused by this distinction. "You had better explain that to me." Deborah Glendinning elaborated: "Smuggling is when the defendants put a product on the market that found its way back," she said. "Contraband is a product that is not made by the defendants." "They are separate products?!" Justice Riordan looked doubtful. "Is that a generally accepted distinction?" Ms. Glendinning stood by her explanation -- but her colleagues on the defence team did not exactly back her up. When Justice Riordan asked Guy Pratte point-blank "Do you agree with the definitions we were given?" the JTI-Macdonald lawyer demurred. "I won't speak to that." Simon Potter did some fancy footwork to get his colleague out of the corner she had painted herself into, while still maintaining the objection to the 'contraband' document. It was a chronological distinction, he said. Smuggling was used to describe 'an historic period' while contraband refers to the more recent experience. Be that as it may, as Philippe Trudel pointed out, in their guilty plea under the Excise Act, the companies had admitted to contraband activities. Justice Riordan looked keen to move on. A "reserve" label was put on the document and later in the day, Justice Riordan decided to put all questions (and answers) on contraband and smuggling "under reserve". During the rest of the morning, plaintiff lawyers Philippe Trudel and Bruce Johnston tried to pull information out of Imperial Tobacco's former marketing strategist (and official witness), Ed Ricard. Between the documents provided and occasional answers, some insights into the company's operations were provided. Some noteworthy exhibits show the company's efforts to stay ahead of social and regulatory changes (Exhibit 323 and 326) and give a detailed history of Imperial Tobacco's marketing efforts and strategies (Exhibit 324 and 327). After the morning break the plaintiff team rotated pitchers. Bruce Johnston's steady flow of hard questions gave the hearing a new intensity. He asked about a memo written by Ed Ricard in 1991, in which he forecast that tax increases would result in an increase in duty free sales and exports. (Exhibit 270). Did Mr. Ricard knew when he wrote this memo that the duty free and export cigarettes would be smuggled back to Canada? After a few indirect replies, Mr. Ricard acknowledged "at some point we knew that it was finding its way back and being sold here." With the clock moving towards the noon-time break and another witness scheduled for the afternoon, Mr. Johnston introduced the question of an agreement between Health Canada and the tobacco companies. A. I think there was -- there was an understanding that goes back to the late '50s, early '60s with Health Canada that the tobacco companies would not talk about the health effects of their products, and that Health Canada would take the role, duty and responsibility to do so. ... [Health Canada] said: "Imperial Tobacco, you are not going to say anything about all these risks." ... They said: "You are not going to talk about the health aspects or potential consequences of the product. That's the duty of Health Canada to inform Canadians." Q. Was this in writing, by any chance? A. I have seen it in writing, yes, and I have seen it in statements from Health Canada. In response to a request for documents related to such an agreement, Imperial Tobacco provided not one but 62 documents. Impossible to know whether they were the ones Mr. Ricard had in mind that day, as he did not review them either before they were sent from Imperial Tobacco to the plaintiff lawyers, nor when the plaintiff lawyers provided them to him in anticipation of his appearance at the trial. Before he returns (at a yet unspecified date) Mr. Ricard has undertaken to look at all of the 62 documents and identify any that he might have been referring to when he said he had seen a written agreement. At 12:25 Mr. Ricard's testimony was suspended. David H. Flaherty may not be a household name, but he is a man with a distinguished career. He is a professor emeritus of history and law at the University of Western Ontario. He was the first Information and Privacy Commissioner in B.C. appointed through a merit-based process (and not by appointment), a position he held from 1993 to 1999. He is an older brother to federal finance minister, Jim Flaherty. Although Mr. Flaherty spent almost two decades working discretely for tobacco companies, this activity does not appear on his curriculum vitae. He is an expert witness in this case for Imperial Tobacco, but had been requested to appear today as a fact witness. Mr. Flaherty's testimony took less than an hour. In response to questions posed by André Lespérance, he told of being approached by three separate law firms, each representing a tobacco company. They were looking for an historian, he explained. At first he wasn't sure what the purpose of the task was, but later realized that it was probably for litigation purposes. He was never asked to keep the work confidential. Only once in 25 years, he said, had he had direct contact with the tobacco industry. Before he could provide details on what happened at that meeting, objections were flying across the court room. Quickly, the real issue of the day was before Justice Riordan: could David Flaherty's work on the Four Season Project be admitted to the trial, or was it subject to privilege? Mr. Flaherty was sent home, and will likely not be seen until Imperial Tobacco calls him to provide his expert testimony. Litigation privilege or solicitor-client privilege? Plaintiff lawyer André Lespérance did not suggest that David Flaherty's report was never privileged. "It is clear that the companies gave him a mandate to prepare for litigation," he said. In comparing the 1988 version with the opinion presented in this trial, he found numerous similarities. But the litigation privilege that might normally apply to this document no longer applies, he said. "Because the document is on the web-site, privilege has been waived." Suzanne Coté had a different view. Mr. Flaherty's work was not produced in connection with this or other litigation, she said, but under the category of solicitor-client privilege. "The solicitor-client privilege never ends," she said dramatically "the lawyers take it to their coffins." The fact that the documents in question were compelled evidence in other trials did not mean that the privilege was lost, nor that other companies could waive privilege for Imperial Tobacco. Further submissions to support her views were offered by Guy Pratte for JTI-Macdonald and Simon Potter for Rothmans, Benson and Hedges. David Flaherty, had he been allowed to stay for the discussion, might have enjoyed the irony of the moment. 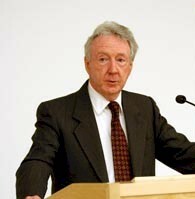 During his tenure as Information Commissioner for British Columbia he made frequent assessments on the use/abuse of solicitor-client privilege. Now it was his work that was under discussion. He might also have found it ironic that the plaintiffs were arguing to have the work of a defendant's expert admitted and that the defendant's were arguing against a similar report to their commissioned opinion being on the trial record. André Lespérance's closing comments clarified this seeming oddity: Mr. Flaherty's work over the past 25 years showed that Imperial Tobacco was in preparation mode for lawsuits. Yesterday, a list of Imperial Tobacco's undertakings had been filed (Exhibit 297-12). In them, Imperial Tobacco had denied that its change in policy on document retention (made around the same time as the Four Season Project) had any relationship to litigation concerns. The company was preparing for litigation at that time, suggested Mr. Lespérance. "The Flaherty report shows that there was an intention or expectation of litigation." On that note, Justice Riordan gathered his materials, and the room stood as he left the court. Day 28 - Do they not like Mondays? Ex-303: How to advertise to teens. The opinions expressed are those of the writers, and not necessarily those of supporters. Powered by Blogger.